Blend ingredients well in a blender. Pour into saucepan and heat for 3 to 5 minutes over medium heat until warm. 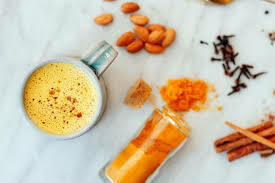 Benefits: Turmeric is great for putting out the flames of inflammation. Its benefits are amplified and made more bioavailable when mixed with fats like coconut and spices like black pepper. Ginger is another great anti-inflammatory and gut-healing tool.